Description (ebay): Or simply complete your collection of over 400 brilliant DMC embroidery floss shades. UPC: 077540919291. International Standard. Master Card. DMC embroidery popular color floss pack has 36 newest skeins of DMC 100-percent cotton embroidery floss. Each skein is 8.7-yard of 6-strand thread. Needlework treasures are sure to look spectacular when stitched with DMC floss with its superior quality and luster unmatched. 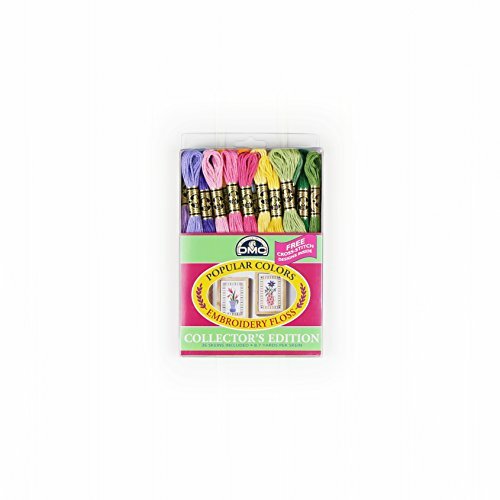 This floss is perfect for cross stitch, needlepoint, gallery crewel, embroidery and other needlework projects. This factory sealed package contains 1 skein each of the 36 color.